California residents are very fortunate that we get to enjoy mild temperatures for most of the year. Weather may not always be the reason for the need for long-term boat storage. Regardless of the reason, there are ideas for preparing a boat for storage that will help you easily get it back into the water when the time comes. A few things should be considered when looking into the best type of storage for your watercraft. The main causes of damage during storage are rain, snow, and the inherent moisture. Extremely warm or cold temperatures, and sun exposure are damaging, and mechanical issues may develop simply because the boat is not being used regularly. When thinking of the elements that can cause damage to a watercraft, ideas for storage come to mind. Home storage on a trailer. While home storage of boats and smaller watercraft is seemingly convenient and affordable, there are factors that can complicate this option. The only way to keep watercraft completely protected from the elements is to store it indoors. At home, this is your garage. Watercraft in the garage uses necessary space for vehicles, thus subjecting them to the elements. An additional consideration to this option is that many areas do not allow recreational vehicle storage on the curbside. Marina storage allows boat owners to keep their boats where they will be used, but this means a boat is in the water all the time. Marina slip fees are the most expensive storage option. Boatyards, which store boats in dry areas, may provide a level of service that some boat owners find necessary. Those who are unfamiliar with, or do not have the inclination to perform their own winterization and other forms of maintenance may find the expense of boatyard storage worth the added benefit of such services, which come at a considerable extra charge. A boat storage facility, such as Vines Storage, provides both indoor and outdoor options for boat owners to protect their watercraft. 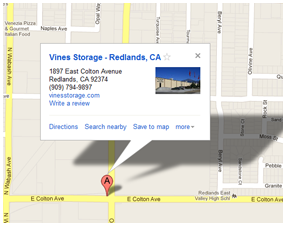 Choosing a storage unit in our Redlands facility means that your garage is reserved for your primary vehicles and your lawn is saved from becoming a secondary storage area. Our property is protected with 24/7 security, keeping all stored items safely behind tall walls and cameras. Although there are several options for boat storage, not all are ideal for every situation. Contact us for more information on our boat storage capabilities.